Building Energy Rating (BER) Certificates – Worried ? 2008-12-12: Thursday, 1 January 2009, is fast approaching, and any person offering an existing house for sale or rent around this time is being bombarded by all sorts of ‘marketing blurbs’ in the different media about having to produce a BER Certificate. When in doubt, go directly to the actual legislation … and in this case, it is Statutory Instrument No.666 of 2006: European Communities (Energy Performance of Buildings) Regulations 2006. Legislation cannot be retrospective … so, if a house has already been offered for sale or rent before 1 January 2009, no BER Certificate is required. Colour image of an Irish BER Certificate. See S.I. 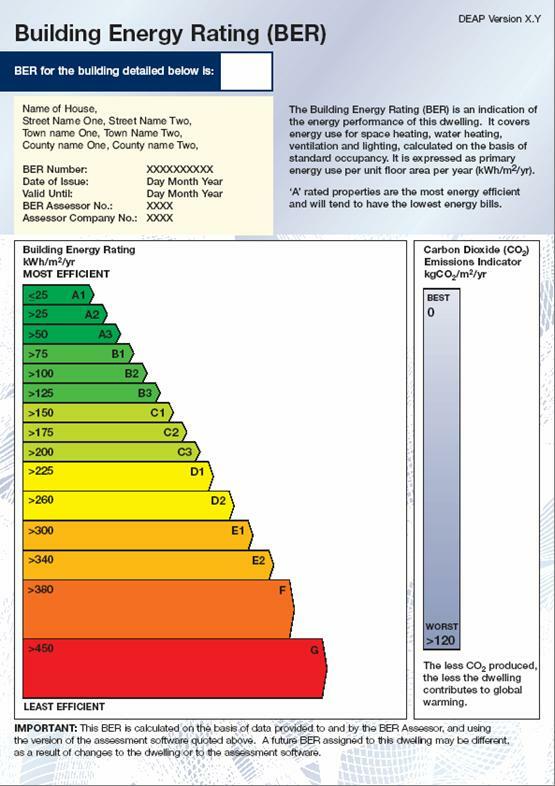 No.666 of 2006: European Communities (Energy Performance of Buildings) Regulations. Click to enlarge. However, unless long wave infra-red thermography has been used under proper conditions, by a competent person, as part of a comprehensive energy survey of the house … and thermal images were taken … and other accurate and precise information was gathered about the actual energy performance of this specific house … the statement in the BER Certificate is misleading. There is only a very tenuous relationship between a BER Certificate and the ‘real’ energy performance of a specific building. What’s more …. Energy Ireland (SEI) knows full well that this is the case. In addition, as if that were not bad enough …. Energy Ireland (SEI) have been sitting on a Report for approximately 3 years which indicates that there is a general non-compliance rate of 70% (that’s right folks !) with the minimal – some might say “abysmal” – energy performance requirements, which apply to new houses, in Part L of the Irish Building Regulations. And …. because everybody can see that our national system of building/technical control in Ireland is entirely inadequate, that figure of 70% non-compliance may be an underestimate. Many, many months ago, I asked for a copy of this SEI Report. National Disability Authority – Viable ? The question which I have been asking myself for a number of years is: “Does the NDA serve the best interests of the Irish Disability Sector ?”. Back in September 2005, for example, I drafted a submission on behalf of FireOx International, SDI’s Fire Engineering Division, concerning the Department of the Environment, Heritage & Local Government’s Outline Disability Sectoral Plan (2004) … and its serious omission of any consideration of ‘fire safety for all’ in buildings. ” The 2005 Disability Act (Number 14 of 2005) is a deeply flawed and inadequate piece of legislation; and every individual and/or organization associated with its inception and development should be thoroughly ashamed. It is an outrage, and a national disgrace. See the full 2005 FireOx International Submission. Earlier this year (in April 2008), when reviewing a new National Disability Authority Publication: ‘Promoting Safe Egress and Evacuation for People with Disabilities’, I discovered – much to my great surprise – that the authors of the document, White Young Green Consultants (Ireland), had cut some corners and used copyrighted material developed by FireOx International for their commercial gain … without any permission. This was later acknowledged by the National Disability Authority. This NDA Publication also has many technical errors. Maybe … it is Ms. Angela Kerins who should have resigned long ago … and not Mr. Niall Crowley ?